We have two more amazing shows for ya as part of the 7th Sephardic Music Fest! Tonight, keep an eye put for our concert with Gerard Edary, Asefa and Oudblues at 6th Street Synagogue and Tomorrow night (Dec 27), Don’t miss out on The Sephardic Story Slam at The Triad Theater hosted by Comedy Central’s Ophira Eisenberg, featuring celebrity judge Vanessa Hidary aka The Hebrew Mamita. Join us as storytellers from far and wide, actors, poets, writers, comedians and other doe-eyed hopefuls try their hand and taking home the most coveted prize of all time: The legacy of being crowned: “Story Slam Champion” !!! Featuring stories by Miriam Ben-Dor, Daniel Brooks, Ilya Kodosh, Dina Plotch, Noam HARARY, Moran Hizgilov, Sonya Loya, Eliyahu Enriquez, JANET KIRCHEIMER, & Michelle Slonim. 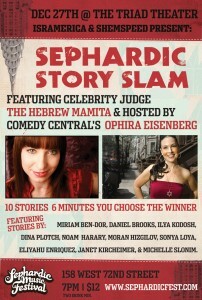 Come see who will be crowned ‘Story Slam Champion’ on Live TV!! !